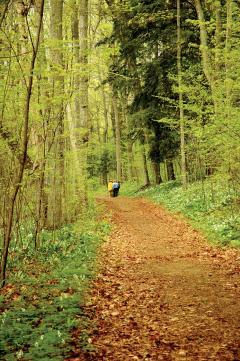 Hiking in the Traverse City area can be fun in every season, but spring is one of the best times to be out on the trail! Why? Well, partly because it’s such a delight to be out on the trail, smelling the scents of spring and enjoying the feel of warmth and damp on your skin after a winter of cold, parched air. (And it’s still cool enough on most days that you won’t automatically break into a sweat when you exert yourself.) Also, it’s wonderful to watch new life appearing: the green leaves and shoots rising above last year’s leaf litter, the first buds and bugs, the bright highlights of new wildflowers. But most of all, spring is a great time to explore our region’s many wide open spaces because the lack of foliage means you can see a great deal more than you can when everything has leafed out. The ups and downs of ridges and hillsides are much more defined, and wide views of valleys and lakes can be glimpsed in places where they’re invisible during the summer. I’ve tried to incorporate all those ideas into the three easy hikes in this blog post. They include two of my all-time favorites and one new discovery that’s going to be one of my favorites from now on. Hope you like them, too! Years ago, grocer Jerry Oleson used to grow apples, cherries (and hay for his large bison herd) on a series of connected meadows in the hills above Traverse City’s West Side. 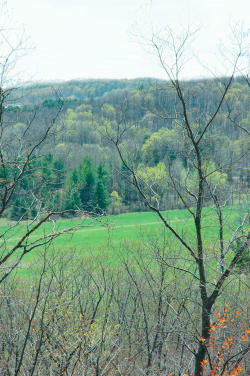 Thanks to a tax millage approved by voters of Traverse City and Garfield Township in 2004, these interlocking fields – high above the city neighborhoods but bounded on three sides by even taller hills – are now a 113-acre park known as Hickory Meadows. This is one of the nicest walks in the city, and I’m always surprised to meet people who have never visited this lovely preserve. It’s a great place for an easy stroll (lots of West Side folks walk their dogs here, and I often ride my bike up here during the lunch hour) but because of its location at the foot of the Hickory Hills Ski Area, you also can combine it with a strenuous climb to the top of the nearby ridges if you’re feeling ambitious. The park has two miles of improved trails, and can be entered at three separate trailheads: a nearly hidden path that starts at the edge of someone’s driveway on Wayne Street, an unobtrusive parking area on the south side of M-72 -- about a mile uphill from the bay -- and a third parking area at the top of Randolph Street, near the entrance to the ski area. As you’d expect, the preserve’s best-known feature are its two main meadows, separated by a fine windbreak of old-growth hardwoods. One has a single trail running down its middle; the other features a loop that’s used by skiers in the winter and by casual walkers the rest of the year. The high hills that surround them make this area feel cozy, and once the spring buds come out the forest seems to be enveloped in a lovely green mist. But there are other delights in the woods; a path that leads under a cathedral of tall pines to a rustic bridge over a stream, a trail leading north to M-72 through a small third meadow and a gravelly moraine that feels like it should be somewhere in Colorado, a hidden frogpond complete with a bench for rest and contemplation, and a secret trail to an east-facing overlook with great views down through the trees to West Bay. Much as I love high windswept places in spring, they’re not always the best places to view wildlife and to enjoy spring wildflowers. For that, you sometimes need a sheltered moist place – like a river valley. Fortunately, Traverse City has one of the most wonderful streamside trail systems in the Midwest: the 505-acre Grand Traverse Natural Education Reserve. 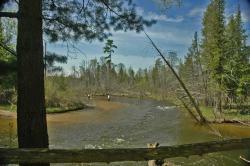 The Reserve’s seven miles of six trail lead along the Boardman River through wetlands, forests and upland meadows, past rushing rapids and quiet ponds – full of birds, deer, otter, mink, fox, and an amazing diversity of flowering plants. Best of all, its trails are broken up into six smaller segments that can be accessed at separate points along the way – so you don’t need to do the whole thing in one hike. My favorite segment these days is the 2.3-mile section that begins at the south end of Boardman Pond. If you park at the Lone Pine trailhead off Keystone Road, you can get a gentle introduction to this area on the short barrier-free Long Pine Trail heads north along the top of a steep bluff above the river to a fine viewpoint over the pond where you can see some of the dramatic changes that have taken place in the valley as a result of efforts to return the Boardman to its natural state. If you turn left after the parking lot, you’re in for an even more dramatic experience. Here the trail plunges down to the water’s edge, where the spring current rushes over rocks and logs, follows footbridges over spring-fed creeks filled with watercress and marsh marigolds, and rises steeply to fine viewing platform and a pretty footbridge that leads to a charming loop through the woods on the river’s west bank. South of the bridge you’ll be at the site of the former Keystone Dam, which washed out in 1961. (The trail passes its crumbled foundations, which rise from the forest like ancient ruins.) The dam’s collapse left a beautiful little gorge behind, as well as the Keystone Rapids, probably the best whitewater paddling area in the Lower Peninsula. There’s a nice little viewing platform here, too, so you can rest a bit and peer down into the rapids before heading back downstream. 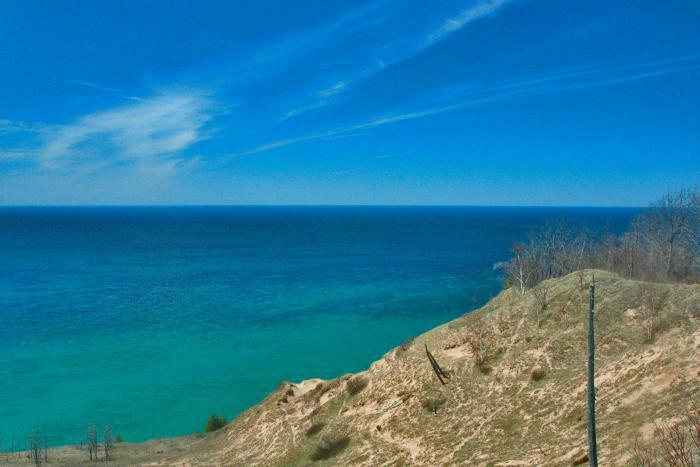 I saved this one for last, because you should endure a little small talk in order to earn the knowledge of this excellent trail – one of the least-known and most beautiful spots in the Sleeping Bear Dunes National Lakeshore. Located just a mile or so south of the popular Empire Bluff Trail, the path to the Treat Farm begins at Norconk Road and follows what must have been the two-track leading to the farm itself. It’s an easy half-mile climb through a forest that’s filled with wildflowers in spring – I was there in early April and there were already clumps of white, blue and violet hepatica bursting out among the leaves. By May, the entire area is carpeted with trilliums! At the end of the path is the well-preserved homestead of Charles and Martha Treat, who moved here in 1912 and farmed this land into the 1930s. The handsome white farmhouse stands on a short bluff overlooking wide meadows to the south, surrounded by a collection of fascinating outbuildings – including a strange circular garage built of concrete with a domed roof. But the real treat (sorry – couldn’t resist!) lies beyond the farm. If you follow the trail another half mile to the west, you’ll notice how it leads off to the left, skirting the foot of a steep bluff known as Old Baldy. You can go that way if you’re not feeling very adventurous. But if you’re not afraid of a little strenuous exercise, take the path that climbs up to the top, where you’ll be rewarded with one of the most beautiful views in the entire park, a rare taste of what this coastline looked and felt like when no one lived here but a few hardy farmers. Standing at the top of the path, the wind rushing past your face and the golden curve of Platte Bay hundreds of feet below you, you’ll feel like an eagle poised above an abyss of deep blue space. The trail suddenly branches off into dozens of smaller trails – made by humans and animals – but there’s no way down to the water, so don’t even try. This is a place made for contemplation, for awe and for reverence. With any luck, you’ll probably have it all to yourself. Let it sink into you for a bit, -- and when it’s time to leave try, to make sure that those who come after you will be able to have the same kind of experience. There aren’t many places like this left in the world. Don’t make me sorry I told you about it.